When the Computer Age arrived, we were promised a paperless society. I can tell you from my experience at NDSU that nothing could less accurate. Twenty years ago in ARCH 321—first half of the two-term architectural history sequence—I would hand out a syllabus for the semester (goals and objectives for the course, tests and other assessment dates, in-class presentation topics, etc. ; if any of you still have one, they’ve got better since then). If they lost it, a replacement was handy, thanks to photocopiers. Tests were paper-based, in-class encounters (written or, eventually, OpScan) that took ages for me to grade. Sorry about that. Today, however, on-line PDFs are always available, but we’re all inclined to print it off at each consultation. On-line testing ought to save paper, but I have a suspicion that it doesn’t. Last semester, for example, I looked into the statistical/analytical stuff on BlackBoard and discovered at least one student who had taken the exam seventy-two times—the number of questions—and probably did a screen capture for each question in sequence, because each attempt at taking the exam lasted less that a minute. Frankly I’d rather go back to the old system of thirty minutes and a pencil. 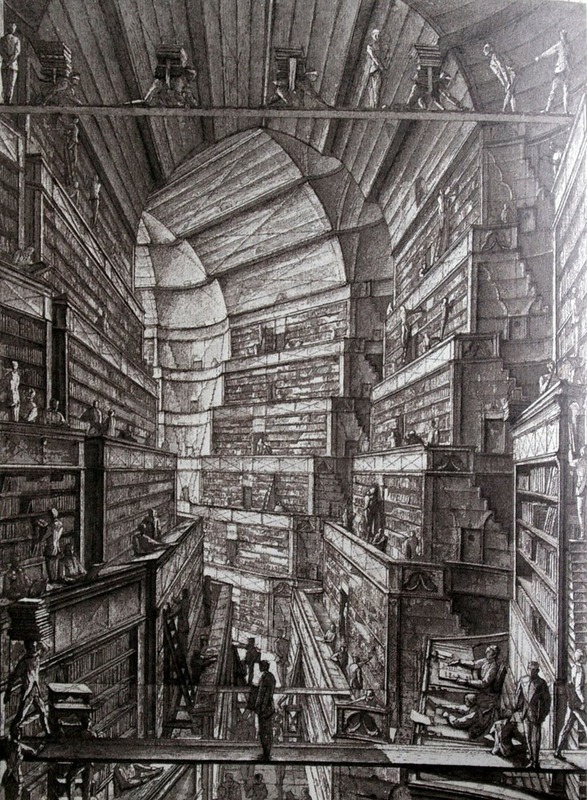 This etching by Erik Desmazieres illustrates Borges’ Library of Babel. So the Computer Age has, in all likelihood, increased our consumption of paper by at least a factor of four. But here’s the real rub. While the consumption of paper quadruples—at a minimum!—books, periodicals and other paper-based information delivery systems are endangered species. The NDSU Main Library hasn’t bought a book in years and the current periodical list has effectively been cancelled. Libraries are, in fact, divesting themselves of their book collections. I know, because I’ve bid on some of them on eBay. So here’s the question du jour: as the owner-collector of a really fine personal architecture library, I not find myself in need of a place to put it. And please restrain the obvious reply to that opening. I will live a while longer. Who knows? Five years. Fifteen, maybe. Though many of those years will find my thought processes softer and squishier than usual. I’m not at all sure how much acuity is already lost. No, I’m not offering my library to anyone who reads this. I want it to do more good than that. But the far larger question concerns the value of libraries themselves as information resources. Is it vanity to hope that younger generations will value those things that have had great meaning for me and mine? I have no children; no blood relations that I’m even aware. My library and my art collection will be my legacies. So my question to you all is this: Do books have any meaning in the digital age? If they do, where should I deposit mine? And you can infer from this that it is unlikely to be NDSU. Just over a century ago there was a movement among American clergy of various denominations and sects called “The Social Gospel.” I invite you all to look it up and consider how far we’ve come toward its antithesis. Simply put Social Gospelers, as they were known, held that Jesus’ message was not a vertical one—his link between humankind and the ineffable—but rather a horizontal bond between himself and the rest of us. Emphasis was put on his role as brother of humankind, rather than son of God. We were all, in the New Testament sense, our brothers’ and sisters’ keepers; no one should feel comfortable until all were given comfort. In the throes of the post-Civil War era and the rise of European socialism, theologians like Walter Rauschenbusch and Washington Gladden reached through the artifice of barriers, not only between various denominations of Christianity (though Catholics and the Orthodox tended to ignore those opportunities for dialogue), but also between and among the sects: Christians, Jews, Hindus, Buddhists, Parsis, etc., many of who joined a great Congress of World Religions convened in Chicago during 1893, contemporary with but distinct from the Columbian Exposition. The Unitarian divine Jenkin Lloyd Jones, founder of All Souls Unitarian Church on Chicago’s south side and uncle of none other than Frank Lloyd Wright, relocated and reinvented his congregation as The Abraham Lincoln Center, attracting both Christians and Jews to its non-sectarian services. I have been interested in the architectural consequences of the Social Gospel movement for almost fifty years and am ready to publish research on what I believe is a genuinely American contribution to the evolution of religious architecture. Those of you who know me and sensed my passion for the so called Akron-Auditorium Plan have also been bored silly by endless tellings of that tale. So, you might well suspect the Social Gospel had reared itself in Agincourt, where I got a chance to design what might have been the last gasp of the Akron Plan—the community’s Asbury Methodist Episcopal Church, built in 1913 from the design of Liebbe, Nourse & Rasmussen, Des Moines architects (who of course had nothing whatsoever to do with the commission). Howard wants to tell us something about Asbury UMC, just a year away from the centennial of its building. I know some of you will find this hard to believe but, once upon a time in America, religion was a force that united rather than divided; something that linked the faithful of various denominations with even the faithless themselves. In the aftermath of Civil War, at the dawn of massive migration from Europe into the abuses of industrializing America, a movement called the Social Gospel worked for the betterment of us all. Abstractions like this are all well and good: until they affect you or someone you know, they’ll be one of those things you remember until the first pop quiz and then they’re promptly gone, so much snow on the water. Until you drive past the corner of Agincourt Avenue and Second Street NW, that is. Asbury United Methodist began its life as one of Agincourt’s first five churches—denominations that gambled for the original “church lots.” Asbury received the “B” lot and built the first of its three successive buildings there in 1860. But it’s the third building of 1913—a landmark building soon-to-be listed in the National Register of Historic Places—that deserves our attention; that not ungracious building links us with an heroic national phenomenon. Agincourt in 1913 was already committed to progressive ideals (a YMCA, a public library) so Asbury’s new church was fitting and disproportionately large for our population at the time. Candace Varenhorst promises to share some information on her predecessor, Rev B. D. Barnes, and his leadership in creating the community’s largest church building—then and now. 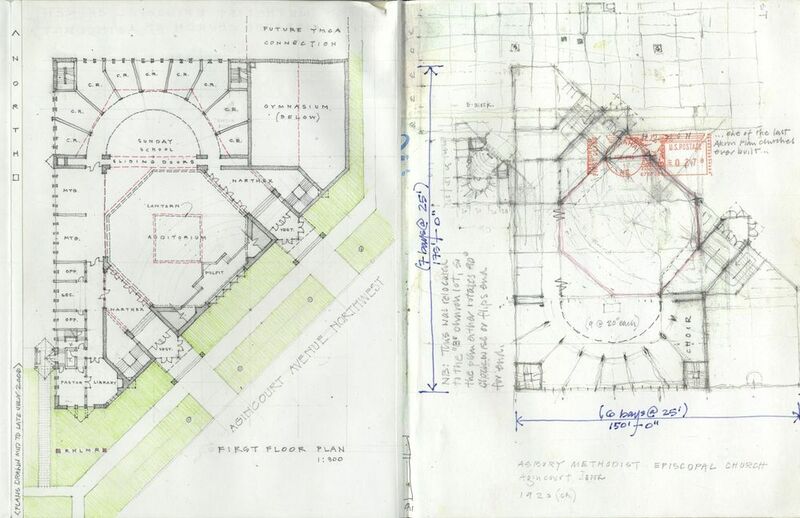 And my consultant and friend Ron Ramsay promises to put the building in its larger context of architectural history. In the meantime, Asbury is testament enough to an earlier faith that we should rediscover. Howard has put me in the spot, I guess. Looks like there’s a National Register nomination in my future. Conductor Michael Tilson Thomas has written an essay on the music of New England composer Carl Ruggles. You may not know Ruggles’ work, there being so little of it and such infrequent performance, but you should. longing and sorrow–for all the great beauty that is lost in life and in the world; for all that is corruptible, for all that has passed away. Each one of these feelings resonates within me. Ooops, sorry for that sonic reference. Last Saturday night may have been a landmark in Agincourt history. It certainly was for me. On a per capita basis, Agincourt does pretty well in both the quality and quantity of cultural events. Saturday was no exception, particularly in the realm of music. For sheer small-C catholicity, you could choose among “He-She & the Screamers” (who last played the Yellow Brick Roadhouse almost two years ago in August 2010); “Mumford & Sons” at The Auditorium; our own jazz group, the “Muskrat Ramblers”; and the Upstart Quartet, a string ensemble from St. Louis. What’s a body to do? None of these could be tivo-ed—the salvation of our digital age—so I was torn in more ways than a Medieval heretic. I missed He-She when they were here in 2010—the first trans-sexual grunge band to play these parts—and played to a rave review by my pop culture guru Jeremiah Johnson. So they were a high priority. But Mumford & Sons are unlikely to pass this way again. Our chief of police Lara McGilvray plays a mean clarinet, which temporarily raised the Muskrat Ramblers to the top of my list. Chief McGilvray isn’t a regular with them, so their Saturday night performance might never be heard again. That’s the very nature of jazz, however, so I considered the newly-formed Upstart Quartet—new kids on the cultural block and renowned for programming contemporary works, like Saturday’s premier of “Axiomatic” by Kieth Carman. Weekend opportunities like these aren’t as regular as one might like, but they happen often enough to raise smalltown life above the ordinary. So, culture vultures take note: there is a new cultural events calendar at The Daily Plantagenet website. Howard’s a music freak, I suppose. He didn’t tell you about The Archers baseball game—Agincourt Archers versus the Wichita Wingnuts, a grudge match from a humiliating defeat last year in the playoffs—or the antique show at the Farmers’ Market or a half dozen other activities that could have punctuated the end of his week. His point is simple: Towns can be small and so can minds. But don’t assume the latter only lives in the former. From where I sit, the Enlightenment has never looked so good. Voting in the North Dakota primary is safely behind us and I am pleased to report that two issues were happily resolved on the side of reason—by which I mean reasoned argument, rather than hyperbolic advertising, seemed to carry the day. So, now that I’ve vented on the lunacy of current political rhetoric, please let me wax nostalgic on the origins of the Enlightenment-inspired plan for Agincourt, Iowa. I’d convinced myself that Agincourt’s progenitor had been Philadelphia, William Penn’s deceptively simple urbanism of the late 17th century. 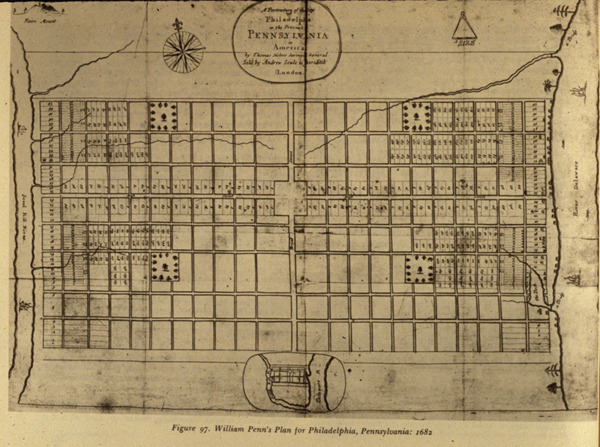 Ask me about it some time; I’ve written a forty-page paper about Philly’s plan through the middle of the 19th century, when it could still have reasonably inspired a townsite in northwestern Iowa as late as the 1850s. But sleuthing this evening on the internet I happened on Andrew Ralston’s 1821 plan for Indianapolis and realized another hidden influence. I recall it but had to look for information on Ralston, who, it turns out, had been an assistnat to l’Enfant in the design of Washington DC. And while we’re about it, who can forget Doty’s landmark plan for Madison, WI, slightly later than Indianapolis but soon enough to predate Agincourt. These three plans seem to embody the best Enlightnement thinking about cities as networks for Democracy, a neutral matrix for the best aspects of the American Century. *A phone survey just ten minutes ago tells me they’re already planning a rematch on so-called “religious freedom.” Ladies and gentlemen, gird your loins! There are any number of imagined places and spaces. Environments of the mind are a commonplace in literature. William Faulkner, for example, created Yoknapatawpha County, perhaps one of the most familiar literary landscapes of all time but it’s embarrassing to admit I’ve never read Faulkner. So other examples come more meaningfully to mind as inspiration for Agincourt. I hope to write an essay here about them very soon. My time, after all, is running out. An episode of Rod Serling’s “Twilight Zone” has stayed with me since I first saw it in the early 1960s: “The Stop at Willoughby.” Gig Young plays a harried businessman whose commuter train makes an unscheduled stop at Willoughby, where he leaves the train to stretch his legs and encounters the antithesis of his daily grind. I won’t spoil the choice he makes, should you find the episode on hulu or another on-line site. It’s worth the search. The creation of bucolic settings like Willoughby has been repeated on the big screen with “The Truman Show” and my personal favorite “Pleasantville,” both of them stinging refutations of the so-called New Urbanism. Seaside, Florida provided the setting for Truman; I don’t know whether Pleasantville is real or a confection on the back lot at Warner Brothers. 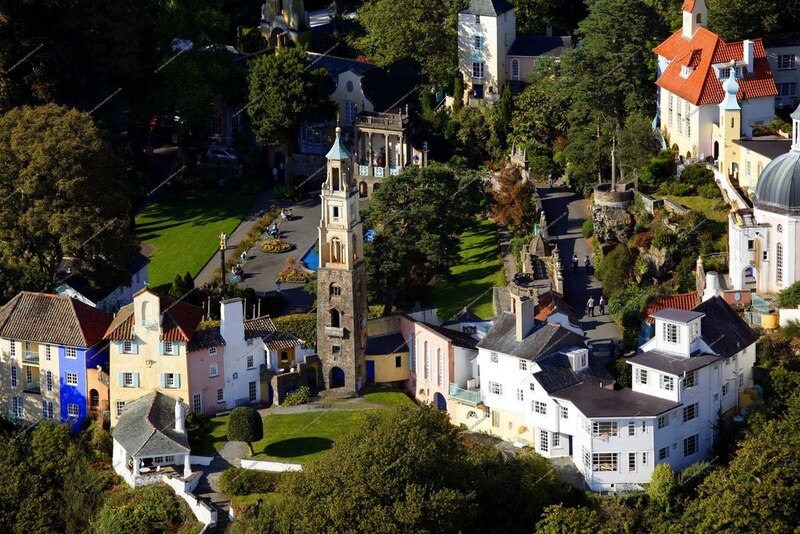 Which brings me to Portmeirion, an imagined village on the north coast of Wales conjured by architect Clough Williams-Ellis [1883-1978]. The other principal imagined village was designed for Marie Antoinette, and we know what that got her. All this happened during my undergraduate years, of course, when “The Prisoner” became a cult event one night a week in our dorms. Whether Williams-Ellis was already in my repertoire of Arts & Crafts eccentrics, I can’t recall. But he certainly joined them and has remained part of the family since. There are books on Portmeirion to be sure, but I doubt that any of them offer genuine insight to the mind of its creator. What was Williams-Ellis thinking? And where the hell did all that money come from? The bigger unanswerable question, I suppose, is this: If I had those resources, would Agincourt appear as a field of dreams in Iowa?